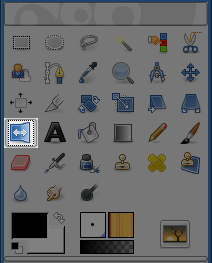 The Flip tool provides the ability to flip layers or selections either horizontally or vertically. When a selection is flipped, a new layer with a Floating Selection is created. You can use this tool to create reflections. by using the Shift+F key combination. Ctrl lets you change the modes between horizontal and vertical flipping. The Tool Toggle settings control flipping in either a Horizontal or Vertical direction. This toggle can also be switched using a key modifier.